Present state: The station was restored as a house and office in 1990, the goods shed is now in industrial use. Notes: South Cave had two facing platforms, but the northern (down) one was displaced slightly to the west. The extensive main building, grand even by H&B standards, was on the broad south platform. Built of red brick its two-storey stationmaster’s house had a hipped roof from which pairs of gables stood forward on the platform elevation and facing the forecourt, while lofty single-storey sections continued both east and west. The western section under a pitched roof contained the office range, and it ended with a further gabled element, where the ladies’ room was found. Most of the gables carried decorated bargeboards with half-timbering added on the exterior elevation. East of the stationmaster’s house the single-storey building rose up to a plain parapet. A particularly attractive feature was the awning with a decorated valance which stretched across the broad platform. The opposite platform had a modest waiting shed but its roof was carried forward to form a verandah which complemented the awning on the up platform. 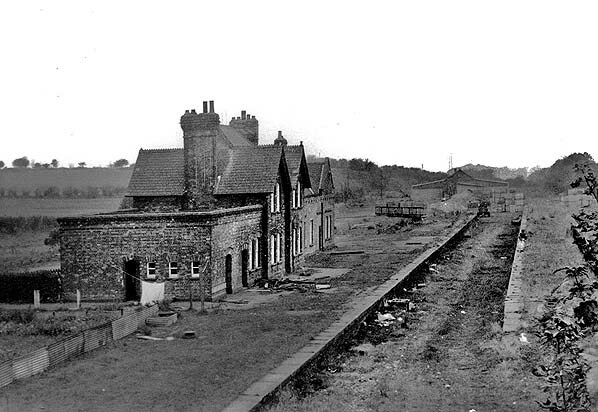 The site of South Cave station was spacious and accommodated goods facilities which handled the standard range of traffic. There were two sidings and a shed and cattle dock south of the running lines and two further sidings to the north, reached from the west. A two-ton yard crane was installed. The 1909 1:2,500 OS map reproduced below shows two weighbridges. The signal box stood directly north of the shed. In December 1895 on weekdays up to 11 trains called at South Cave in each direction – with different frequencies and some calls by request – and two on Sunday. In July 1922 there were nine Monday-to-Friday departures, ten on Saturday and one on Sunday in each direction. The winter 1937 timetable showed nine Monday-to-Friday departures in each direction from South Cave, 13 down and 14 up on Saturday, but none on Sunday. Under BR(NE) administration the passenger service in summer 1950 was similar to the wartime frequency, with seven Monday-to-Friday and nine Saturday trains each way, but in winter 1954 it had decreased to five each way on weekdays, and eight down and seven up on Saturday. By spring 1955 the main building had lost its awning. Use of the Hull-South Howden trains dwindled and the service was withdrawn on 1 August 1955 and South Cave station closed to passengers. 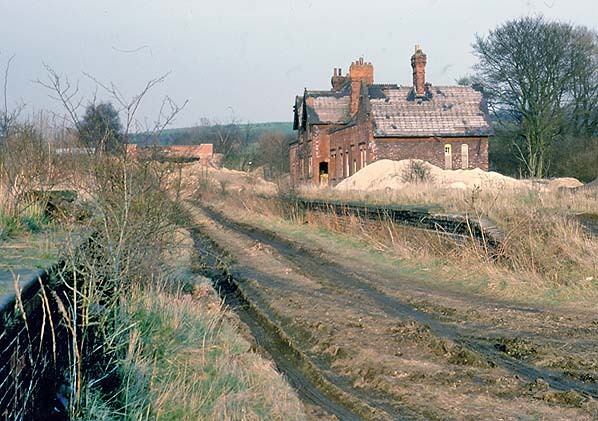 Goods traffic had continued on the line and at South Cave station after passenger closure, but on 6 April 1959 about 35 miles of line from Little Weighton to Wrangbrook Junction were abandoned, including South Cave. 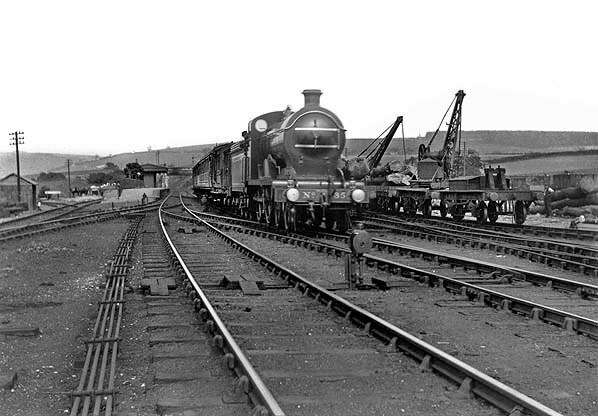 Track-lifting took place through South Cave in June 1963. The awnings and the down platform shelter were removed shortly after closure, but the main building remained in place. 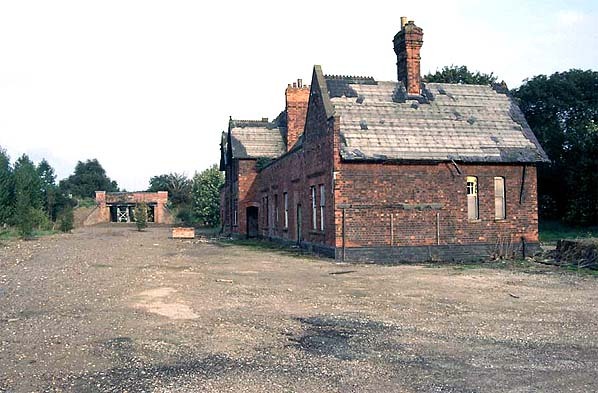 In the late 1980s it was derelict but was restored as a private house by 1990 and the platforms were removed. It is now the premises of a trailer hire firm, W. Clifford Watts; visitors are not encouraged. The HB&WRJR&D Co. began trading with large amounts of debt, and within a year of its opening a price war had begun between the Hull Dock Company and the Hull and Barnsley on dock charges, and between the Hull and Barnsley and the NER on transit charges. Neither of the two Hull-based companies could expect to win against the much larger North Eastern Railway. By 1887 the HB&WRJR&D Co. was seeking a way out of debt and approached the Midland Railway for a possible merger. Reasonable terms were made, but the proposal was rejected by the shareholders of the Hull company. An amalgamation by the NER itself was then proposed, which would have included the NER paying off the HB&WRJR&D's debts; this scheme too was rejected. The Hull and Barnsley, unable to pay its debts, went into receivership for two years until 1889. The Hull Dock Company amalgamated with the NER in the early 1893, – requiring another act of parliament – one condition of which was that in the event of the NER building another dock in Hull (which had already been planned in 1891 as part of an unsuccessful merger attempt between the H,B&WRJ and the NER.) the Hull and Barnsley should give its consent, and be able to make the new dock a joint operation between the two railway companies. Additionally an agreement was reached that there would be no reduction in dock duties without prior agreement or discussion. 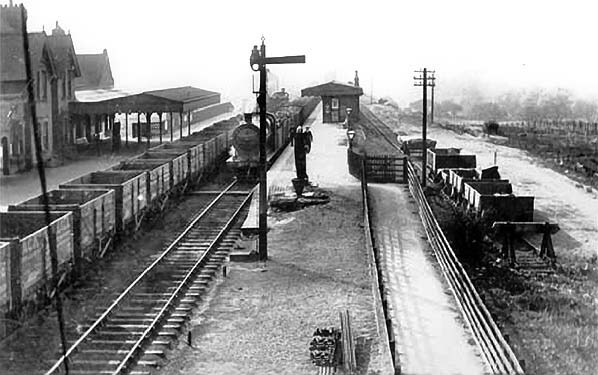 In 1894 the South Yorkshire Junction Railway opened. Though independent, it was worked by Hull and Barnsley engines, and connected the company to more collieries. In the following years of the 1890s various proposals, including another to merge the NER and HB&WRJR&D Co., and others for expansion of the Hull docks came, but were blocked by one party's interests or another's. Finally in 1899 both railway companies had agreed to the construction of a new dock, to the east of Alexandra Dock, access to which was from the HB&WRJ's elevated line via an extension from Alexandra Dock, and from a joint line branching off the H&BR at Bridges Junction. 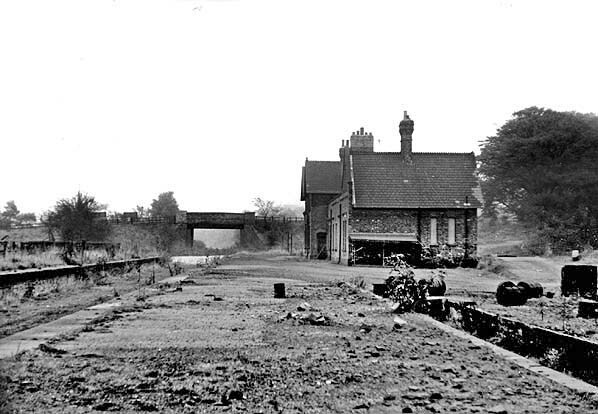 In 1902 an extension from Wrangbrook junction opened, connecting to Wath and further collieries. From 1905 cooperation with the Midland allowed trains to run all the way to Sheffield via Cudworth; the same year Edward Watkin nephew of Sir Edward Watkin became general manager of the company. For these express trains bogie coaches were purchased and M. Stirling's 4-4-0 tender locomotives used. From 1907 at Sandholme there were marshalling yards and a turntable, enabling freight trains to be split in two for the steep section towards Hull into the Wolds hills. Incorporation into the NER was just part of a larger scale of consolidation throughout the British railway system, and on 1 January 1923 the NER along with the Hull and Barnsley line became part of the London and North Eastern Railway (LNER). Passenger services between Hull and South Howden ended in 1955. 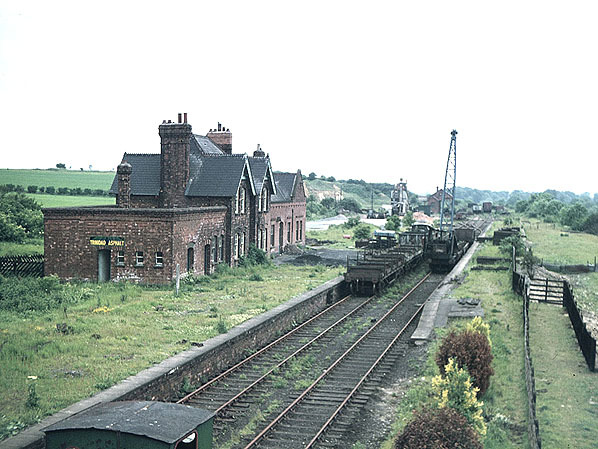 Through freight on the same line ended in 1958, with complete closure between Little Weighton and Wrangbrook junction in 1959. Freight working on remaining sections west of Hull (Springhead) closed completely in the next decade; the section between Moorhouse and Wrangbrook: 1963, between Little Weighton and Springhead: 1964, between Wrangbrook and both Monckton as well as Sproatbrough in 1967, Cudworth to Monckton in 1968. In Hull the bridge over the NER main line at Hessle road was removed in 1962 and the elevated H&BR dock branch section became connected to the Hull to Selby line at Hessle road junction as part of a scheme to reduce the number of level crossings in Hull by routing all rail traffic to east Hull via the elevated Hull and Barnsley Line. All traffic from Cudworth to Wranbrook junction ended in 1967. The branch to Cannon street closed completely in 1968. By 1970 the only parts of the line still with traffic were the Hull elevated section, and a few short sections with industrial uses. Alexandra Dock closed in the 1980s and the rail connection was removed, subsequently the dock re-opened but without a rail connection. Part of the elevated line to King George Dock was converted to a single line in 1988 and one train working introduced, four years later increased amounts of imports; specifically coal; meant that staffed (tokenised) working was reintroduced in 1992. Part of the path of the line between Hensall and Drax was opened for Merry Go Round trains to Drax Power Station in 1972, the Long Drax swing bridge on the Ouse to the north-east offered a link for future developments and was maintained until 1968, but was dismantled in 1976. Other web sites: For a more detailed history and maps see Hull & Barnsley Railway Stock Fund web site. Route map drawn by Alan Young. 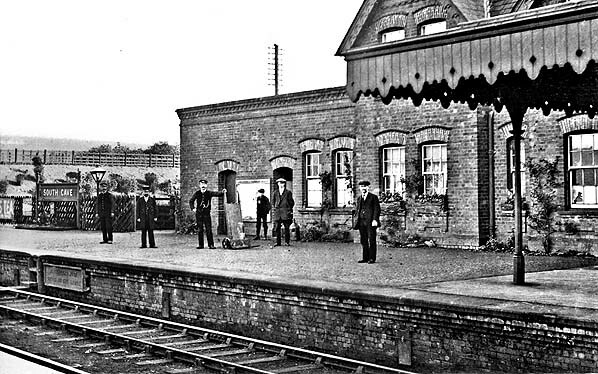 Station staff pose for the photographer on the up platform at South Cave c1910. 1909 1:2,500 OS map. The main station building is on the up side with a brick waiting room on the down side, the two platforms are partly staggered. The goods yard is on the up side although there is also a siding on the down side running behind the platform for its full length. The yard comprises three sidings one passing thorough the small goods shed to a cattle dock at the rear of the up platform, another line loops round the shed. Another siding follows the southern boundary of the yard and served a coal depot. Unusually two weighbridges (WM) are shown. 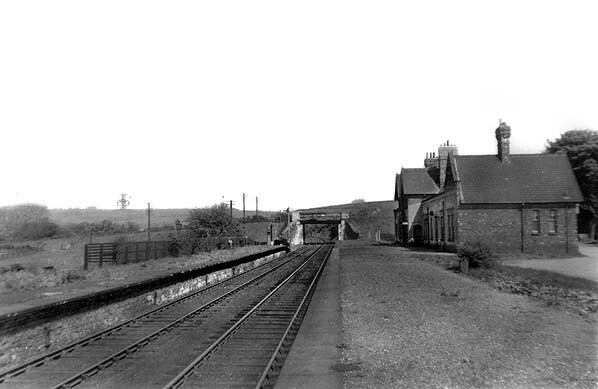 Looking east at South Cave station c1910 as an eastbound passenger train pulls out of the station. No 35 was built for the Hull and Barnsley Railway by Kitson and Co to a Mathew Stirling design. Delivered in 1910 and classified by the H&B as J, these 4-4-0s passed to the LNER and were reclassified D24. All five members of the class were withdrawn in 1933/4 and broken up, their boilers being used as stationary steam units, The sidings at South Cave were on both sides of the line. Two sidings are seen on the down side, one running behind the platform. Two cranes are seen at work in the up yard, one of these is the 2-ton yard crane, the other is probably a mobile crane. Timber is being loaded and is seen on the far right. Looking west from the Kettlethorpe Hill bridge as two coal trains pass in the station. The stagger in the two platforms is clearly seen, access to the down platform is along a path from Kettlethorpe Hill. A long siding runs the full length of the down platform to the rear but the main goods yard is on the up side. The goods shed can just be made out behind the signal and also just visible is the signal box above the roof of the down platform waiting room. 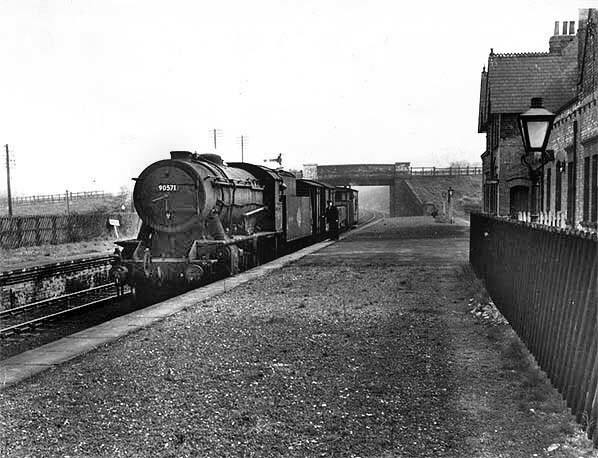 South Cave station after closure in the 1950's as a short class J freight hauled by 90571 waits at the closed platform. This loco is a Riddles designed WD 2-8-0; built in 1943 at Vulcan Foundry and entering WD service in the October as No 7111, it was renumbered in 1945 to 77111 and again in 1948 to 9057 on passing to BR. It was withdrawn from 50A, York North shed during November 1963 and broken up a month later. The road bridge was a notorious A1034 bottleneck; it was removed in 1999 and the road realigned. South Cave station looking east along the up platform in 1959. While some other stations closer to Hull remained open to goods traffic until 1964, South Cave closed completely in April 1959. In this view sidings on both sides have already been lifted, presumably prior to closure to goods traffic, and the down side waiting room has been demolished. South Cave station during track lifting in June 1963. The small goods shed can be seen, partly hidden by the crane. The signal box which was opposite the shed has been demolished. Photo by Peter Brumby from Hull & Barnsley Railway Stock Fund web site. Looking east along the up platform in October 1971. All the track has now been lifted and all station buildings have been demolished apart from the main station building. The cattle dock is seen on the right; a siding ran between the dock and the rear of the up platform. South Cave station looking west from Kettlethorpe Hill bridge in October 1977. Looking east from Kettlethorpe Hill bridge in September 1986. 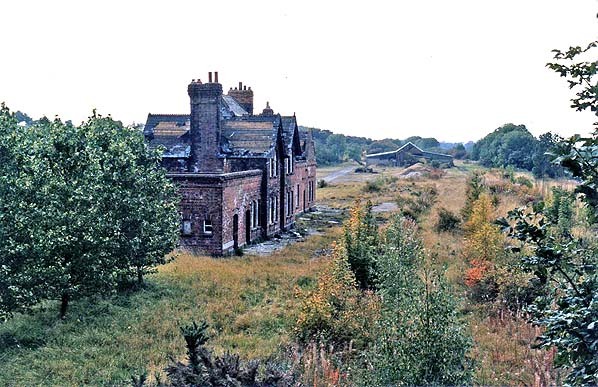 The station building has been derelict for some years and the track bed is now heavily overgrown. 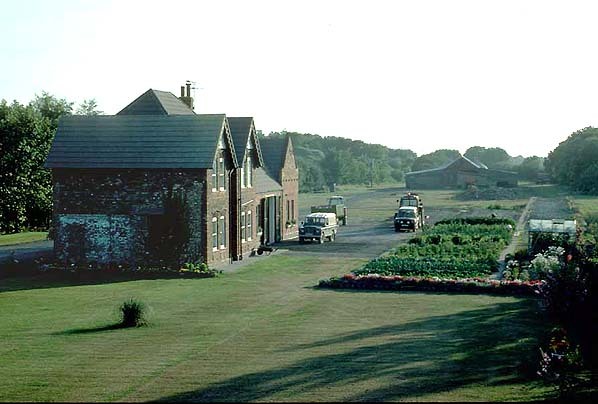 The goods shed has been incorporated into a much larger agricultural building and is still in use to this day. South Cave station looking east in April 1987. South Cave station also in 1987 but a few months after the picture above was taken. The track bed has been filled up to platform level prior to the renovation of the station building. South Cave Station in July 1990 after the renovation of the station building.